It is a non-venomous boa species from South America. It is the largest, heaviest, and second longest known living snake (behind the reticulated python). The term "anaconda" usually means this species. This giant snake (which is called the water boa) lives in swampy areas of tropical South America. It spends a lot of time in shallow water, hidden from unsuspecting prey. 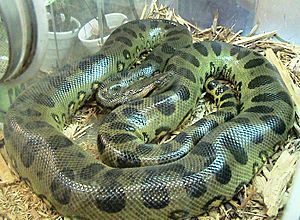 Anacondas give birth to live young; 20 to 40 baby snakes are born at one time. The largest specimens measured 17.1 feet long and weighed 215 pounds. Anaconda Facts for Kids. Kiddle Encyclopedia.